Quick note - we've updated our digital signage price estimator for the first time since its release back in 2012. More accurate pricing, better volume discount estimates, and support for the latest-and-greatest tech are available to all who might want to generate a digital signage project estimate. There are three big upgrades in this version of the price calculator: first, we added an option for 4k support. This basically just bumps up the cost of the screens and media players for those people who simply must have the newest, shiniest objects. Are there cases where using 4k content makes sense? Yeah, a couple. High-end video walls and retail installations might benefit from some really eye-popping ultra high def content, but the vast majority of the time it adds nothing. You remember this graphic, right? 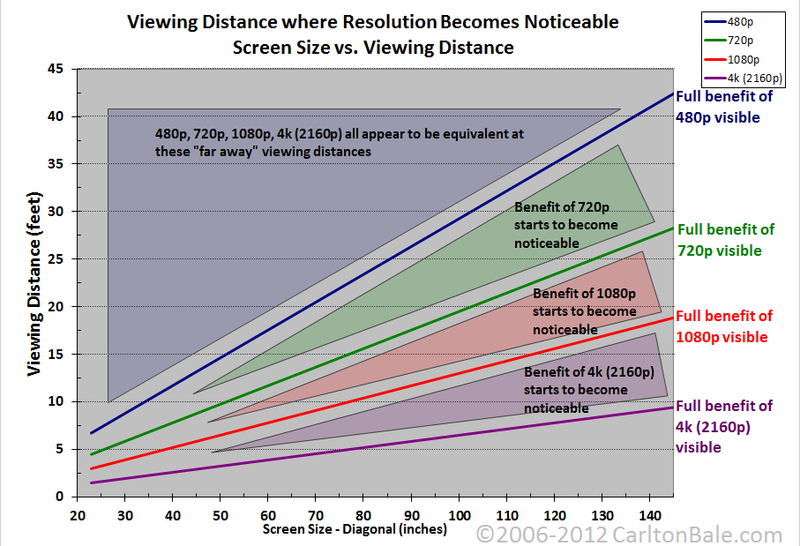 Even in the best case -- and using a huge screen -- the visual advantage of 4k content basically disappears before the viewer is even 10 feet away. Buuut, people want to know how much it costs, so we stuck it in the calculator. Next, we added support for speccing touch screens. We see a lot of projects these days that make use of a smaller touch screen and larger standard screen together, or else touch screens that are integrated into some larger device. Speaking of "larger" we also added pricing guesstimates for a larger class of screen -- 60-70 inch -- but honestly there's so much of a price difference between a 60" and 70" screen right now that our price estimate for that not going to be very accurate. Finally, we considerably improved the way volume discounts are calculated, though honestly no online estimator is really going to do a good job estimating both a 10-screen pilot and a 1,000-screen rollout. But at least now we're making the attempt! I'd love one day to be able to put a content estimator-guideline-thing up to give people a better idea how how the initial capex of installing a network pales in comparison to feeding it content forever, but that's a tall order and perhaps of limited value, since most people who are serious about their projects will so some internal calculations and everyone else... well... they probably won't be interested in a lot of math no matter who's doing it. At one point we also considered something along the lines of an organization estimator which would attempt to quantify the number of people needed to manage the network, create the content, etc. (based on the estimates from Digital signage staffing analysis), but honestly that's hopelessly complicated and would be so extremely error-prone. There are also some additional fixes that we need to make, in particular the handling of very low-cost Android-based players, HDMI sticks and the like. While many commercial-grade systems are still in the approximate ballpark of a lower-end Intel-based player, there is definitely still a good deal of downward pricing pressure, and we haven't fully captured all of that, so it goes to the top of the to-do list. More than anything we'd like some feedback on whether this new and improved estimator is useful, and whether the numbers it's spitting out mirror people's experiences in the real world. Let me know what you think! Thank you for this article about digital signage. There are a lot of aspects that go into these signs that I had never thought about. For example, I did not think about the length of time the content was being shown. It needs to be displayed long enough for readers to understand. I am glad that these things are getting figured out because I find that digital signs are a great way to use modern technology.